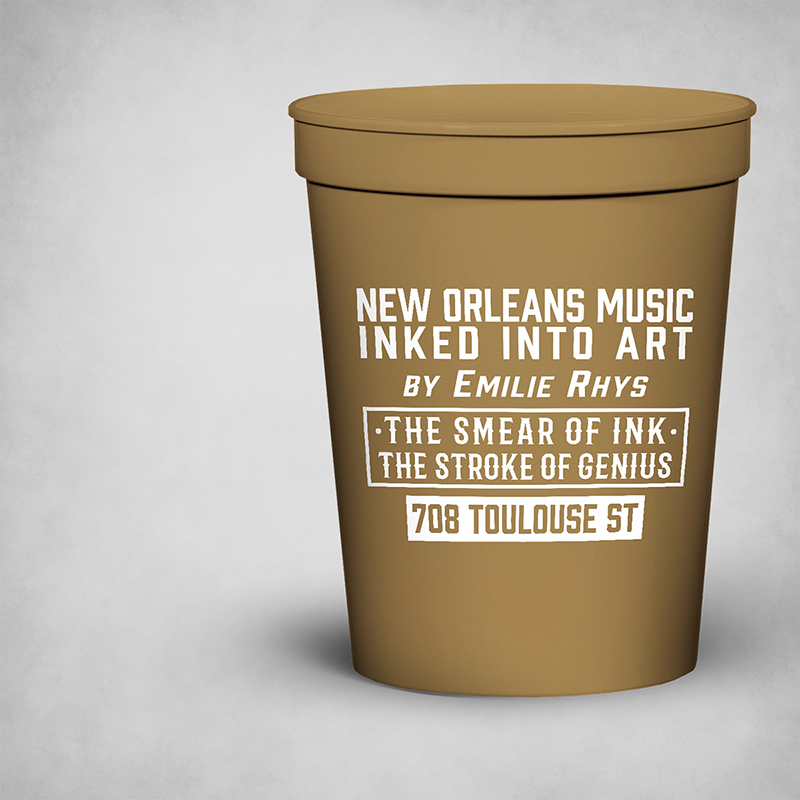 As a third generation artist whose art career spans 40 years, Emilie Rhys has since October 24, 2011 been prolifically producing original artworks of musicians during live performances around New Orleans. In 2016, the artist teamed up with Midnight Boheme to create branding for her artwork as well as brand identity for her newly opened art gallery on Toulouse Street. 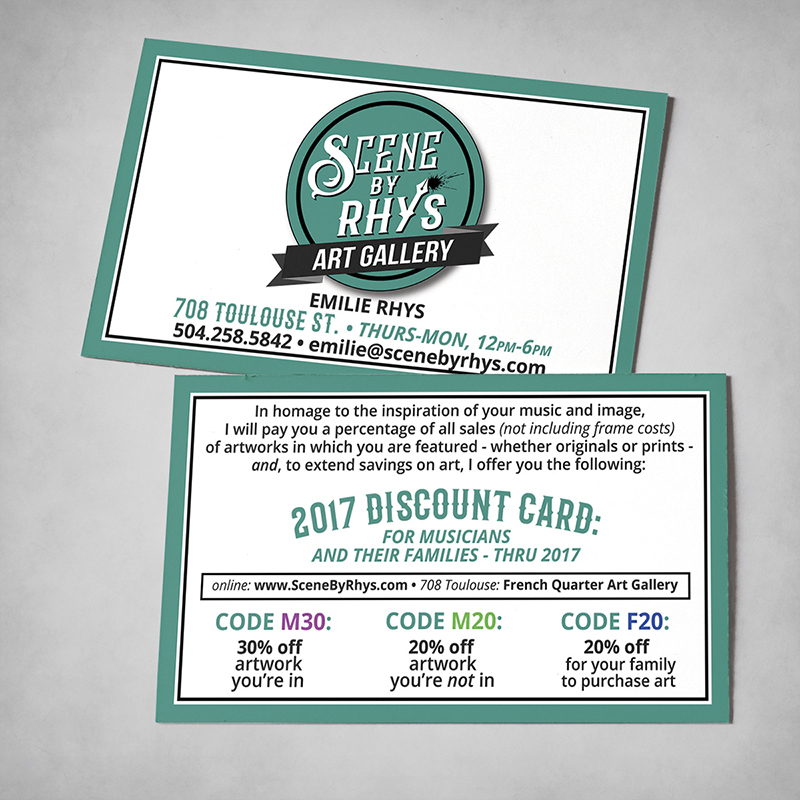 Since that time, the two artists have worked on numerous projects to promote and present Rhys' artwork through digital and print collateral. 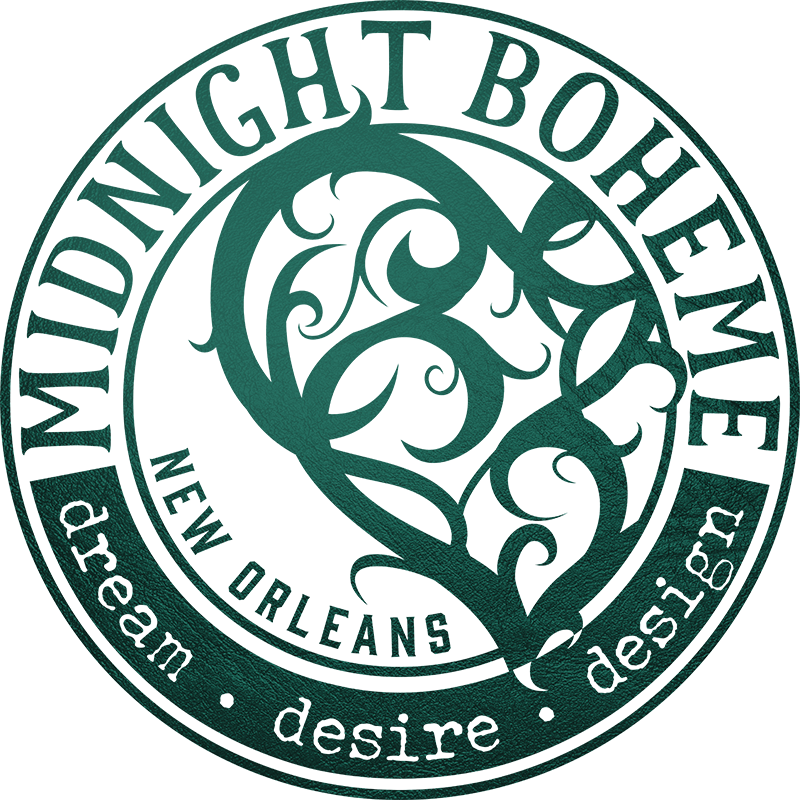 With her fine art gallery located at the courtyard entrance of 708 Toulouse Street in the French Quarter, Emilie Rhys opened her gallery doors to the public after she and Midnight Boheme developed a logo, website, and signage. 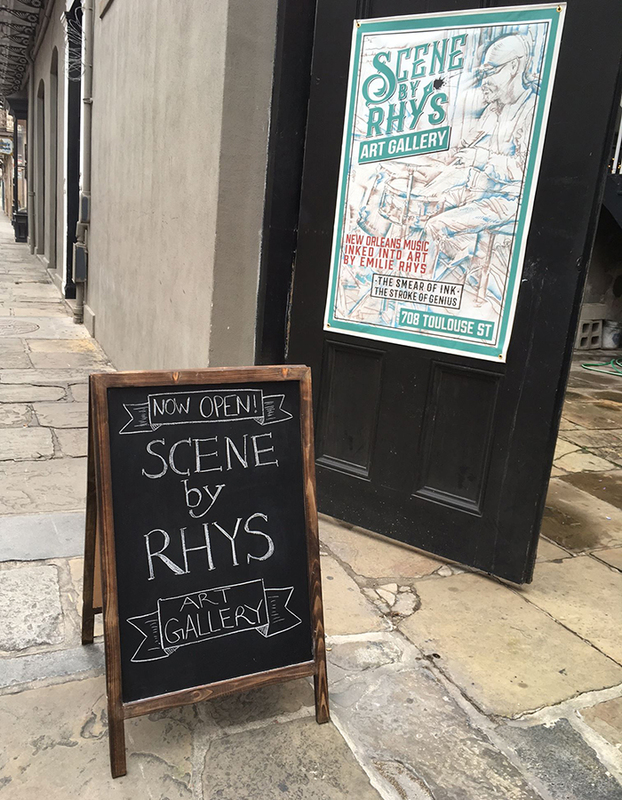 Between Bourbon and Royal Street in the historic French Quarter, Scene By Rhys Art Gallery sits snug in a quaint courtyard setting complete with balcony railings and uneven flagstones. Inside the gallery hangs Rhys' pen and ink drawings, each created during live performances of local musicians in local venues. ART FOR AN ARTIST'S SAKE. 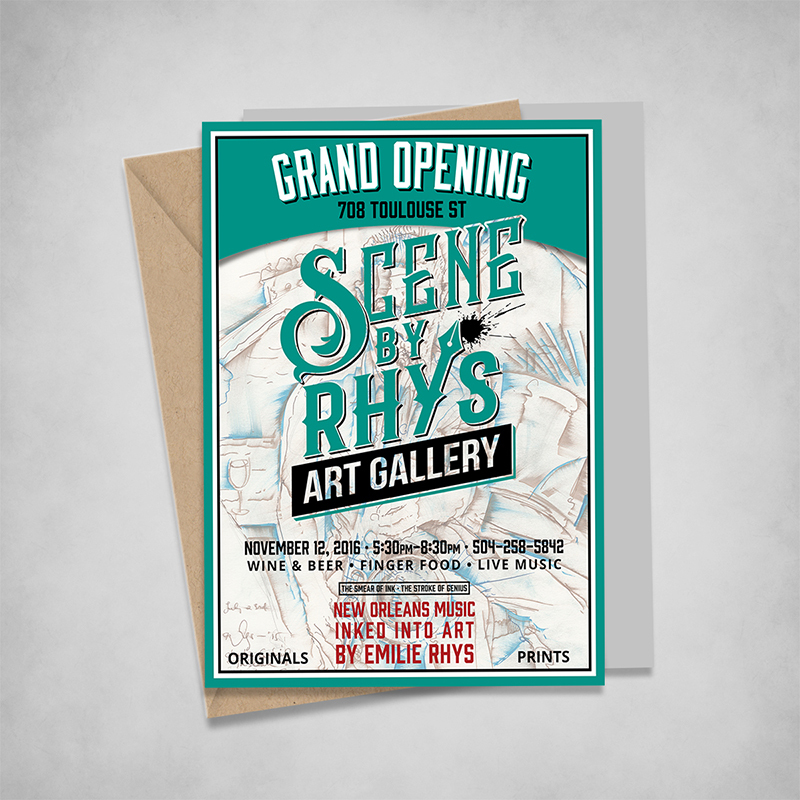 Being an artist herself, Laura Kuhn - graphic designer of Midnight Boheme - is honored to assist in the making of another artist, Emilie Rhys, as she helps create a brand identity for the artist and her fine art gallery. Business cards, promotional items, website development, and other projects have been a team effort since day one. 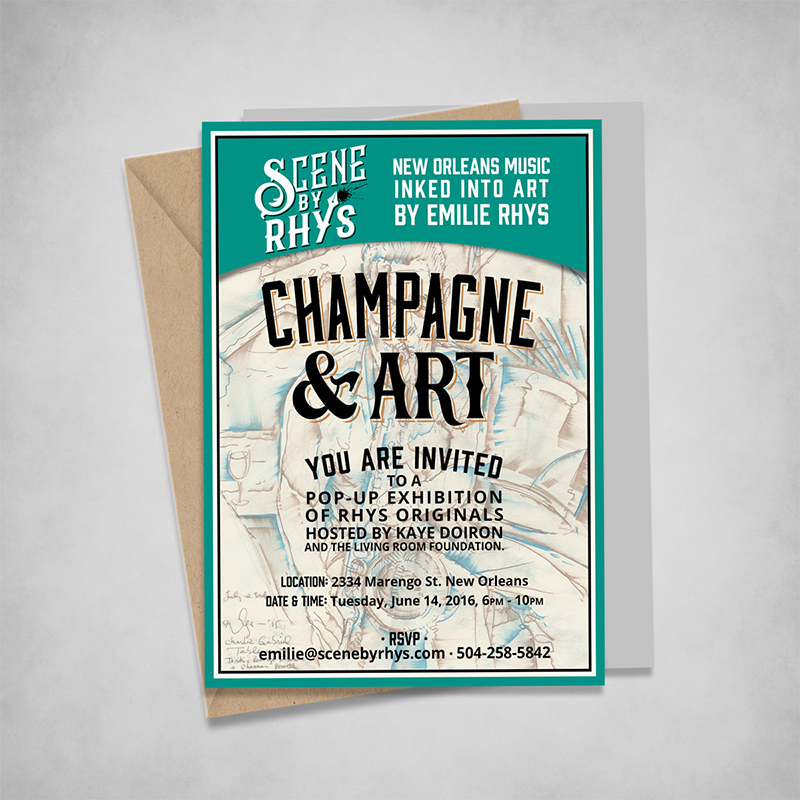 From the art gallery's Grand Opening to the Champagne & Art event, Scene By Rhys and Midnight Boheme have collaborated on numerous projects to design marketing and promotional pieces that feature Rhys' original artwork while keeping with the established brand standards. In New Orleans, ​carrying an alcoholic beverage on the street is not only allowed but encouraged! In keeping with this tradition and to promote the new fine art gallery, Scene By Rhys and Midnight Boheme designed specialty golden plastic go-cups in honor of the gallery's grand opening celebration so that guests could enjoy the art with a beverage and take it with them when they leave. The Old U.S. Mint is now the official New Orleans Jazz Museum, and for its launch party, the museum commissioned artist Emilie Rhys to feature her artwork in a souvenir poster to be sold during the inaugural gala. 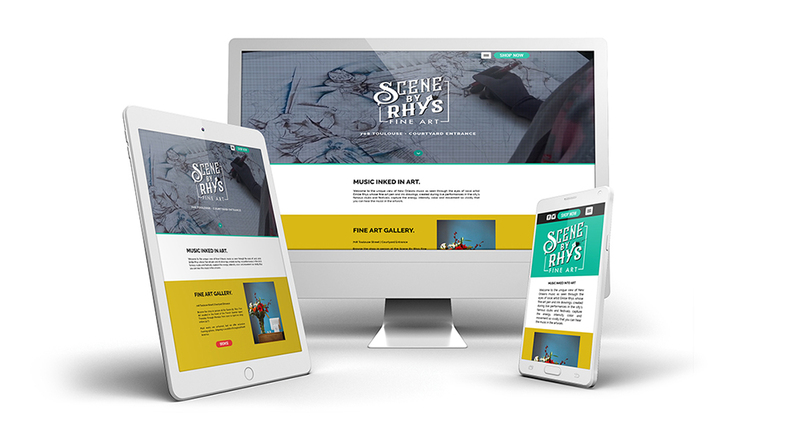 Rhys hired Midnight Boheme to collaborate on the project, and the museum liked the design so much they asked Midnight Boheme to alter the design slightly for promotional marketing pieces such as flyers, posters, and banners. The artwork seen in these works are hand-drawn by Emilie Rhys and created in pen and ink by the artist during live performances of the musicians and singers featured in the art. 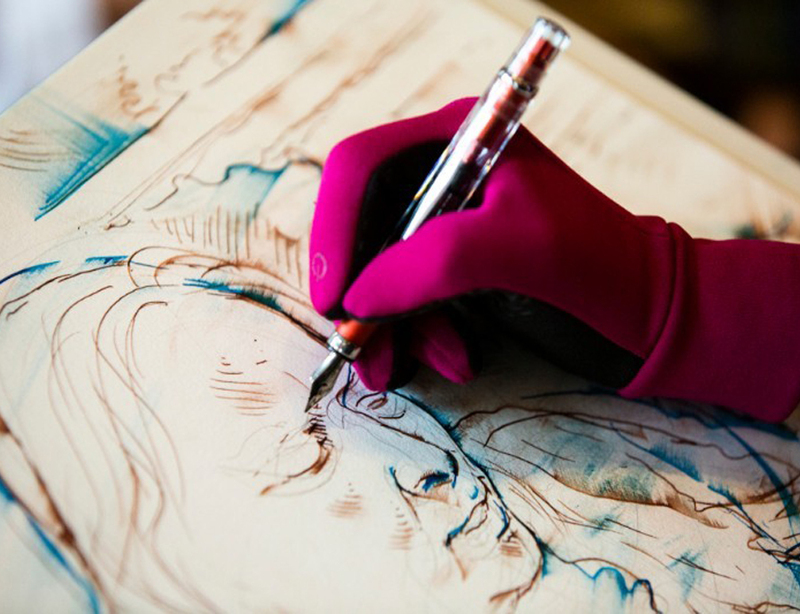 The artist visits local venues nightly wherein she sets up her sketchpad on a table and while the audience enjoys the live music onstage, Rhys captures the music and the movement with her ink on the page. Indeed a unique form of art, these works are available in the Scene By Rhys Fine Art Gallery in the French Quarter and also online at . 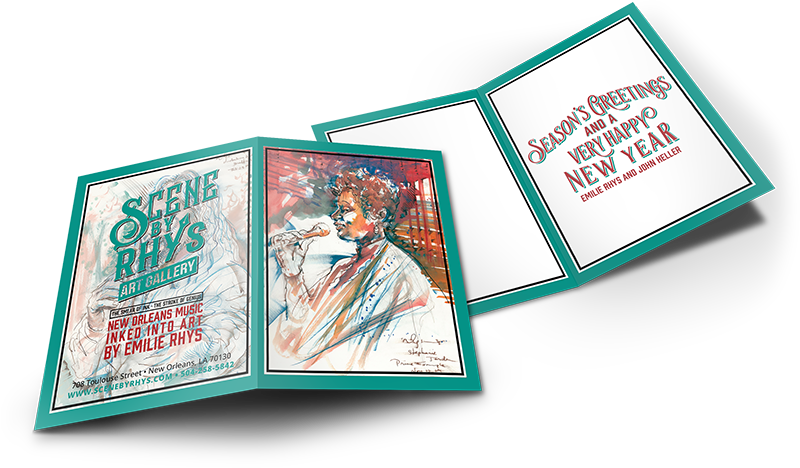 Scene By Rhys enjoys adding a personal touch to everything, so a thank you card and holiday card were among the projects worked on by Midnight Boheme. 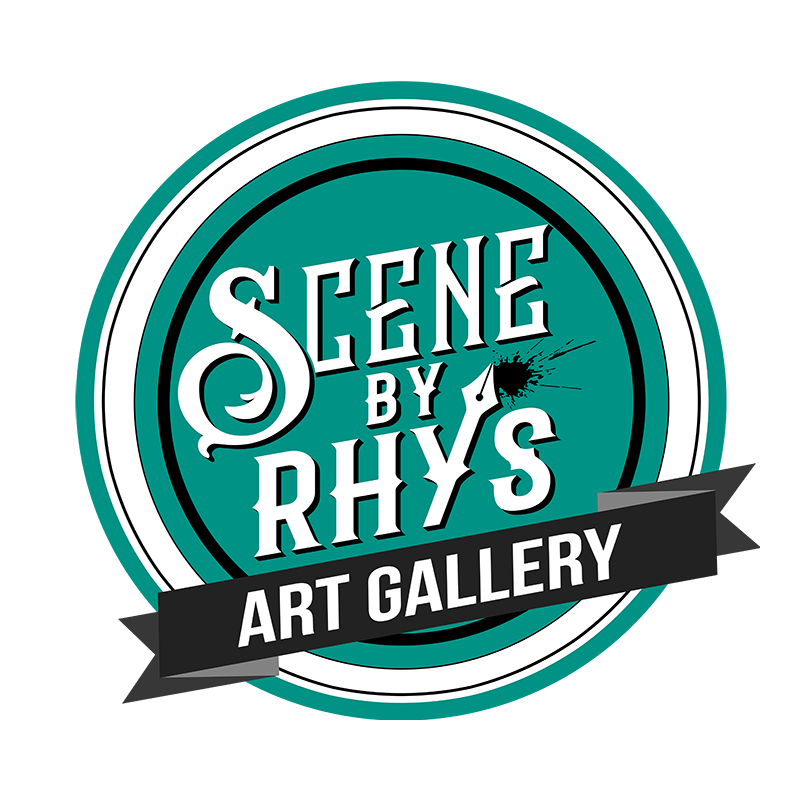 Scene By Rhys and its art gallery can be discovered in person or virtually by visiting the artist's website and the online gallery as developed and designed by Midnight Boheme.